Anemone Reef is the least dived Phuket Scuba Diving Site out of the three sites of King Cruiser and Shark Point, which is great because it means very few boats dive it so there is always lots of room on this site. The site itself is not very big, though it is absolutely stunning. It is without doubt one of the most special dive sites in the whole of Thailand. Level of difficulty: Open water upwards. Quick tip: starting at your maximum depth, spiralling around the main pinnacle as you ascend, will give you the best possible dive here. 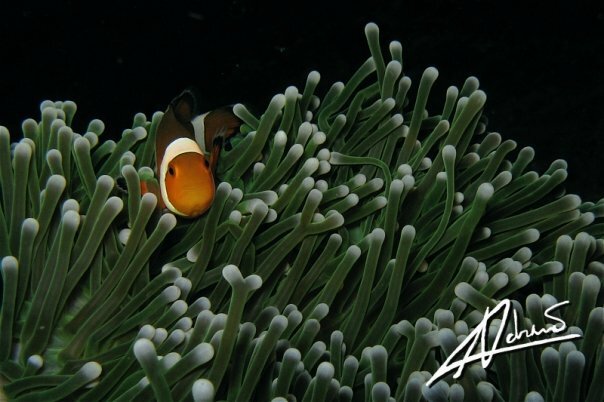 Anemone reef is only 6 metre below the surface. There is and it is advisable to use the buoy line attached to the rock, making descent and ascent much easier to control for the less experienced divers. Anemone Reef got its name from the hundreds and hundreds of Anemones which cover half of this rock called, as many of these wonderfully coloured creatures have made this reef their home. There are Pink ones, purple ones, greens and blue anemones can all be seen swaying like flowers in a summer meadow, all with the movement of the tide. This remarkable garden of colour will leave you in wonder and makes for a truly inspiring dive. When there is a small swelling current which causes the Anemones to wave in the water. The whole reef looks like it is actually moving. Anemone Reef holds a special place in many divers’ hearts, even mine too, it is the first place I ever saw a Leopard Shark, quite a big one too over two metres at least. It is possible to catch site of these graceful predators here. The site is not too far from the King Cruiser and Shark point dive sites, and many companies incorporate them into a one day dive trip, usually included also is Phuket Shark Point. Marine life here: apart from the sighting of Leopard Sharks, it also possible to see; Bearded and raggy Scorpion Fish, Jacks -including Mackerel, Tuna and B;lue fin and Giant (on occasion) Trevallies which all love to hunt around here. Great Barracuda can also be seen waiting for a bite to eat just off the reef, as well as their smaller cousins the Chevron Barracuda, Octopus, Spiny Lobster, a variety of Nudibranch and Morays. Also it is another great place for the camera guy, as there are Pipefish and seahorses living here too.